We just got back from a fun week-long family vacation in California. It was my son’s first time on a plane and he loved every second of it, and both of my children’s first time across the United States. 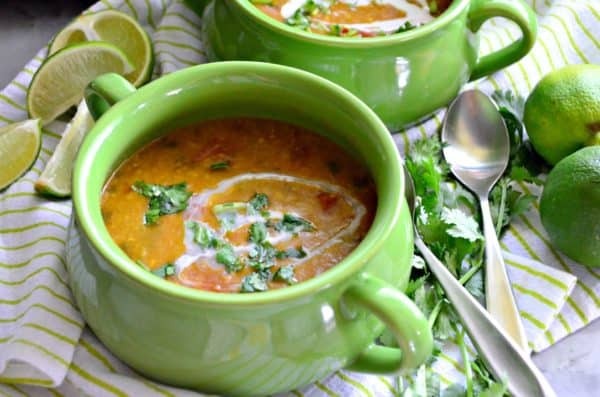 Today, is our first day back from vacation and I felt that this recipe for Instant Pot Coconut Curry Lentil Tomato Soup was perfect to share today. Are you hungry but have limited items in the house? 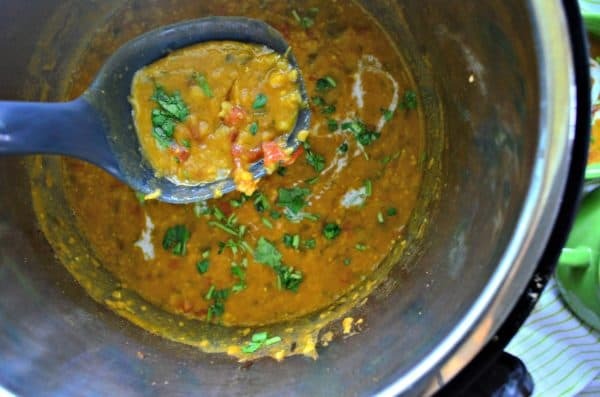 Lately, I’ve been on a mission to use up some more items from my pantry and came up with this easy Instant Pot soup recipe; Coconut Curry Lentil Tomato Soup. Or in my case, like today–I’ve yet to go grocery shopping and need to feed my family a quick lunch. 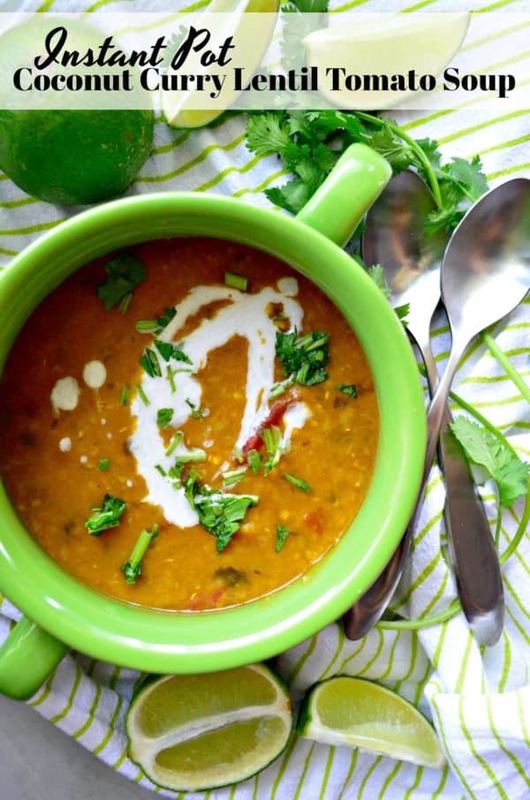 This soup is vegan–a perfect meatless meal option. Although, the lentils fool you making it a thicker soup so your not missing the meat. 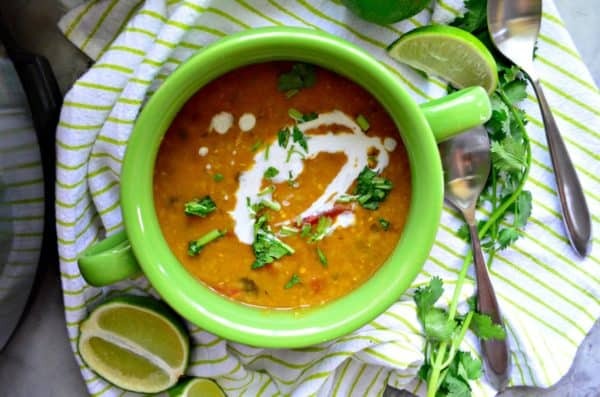 This soup is also gluten free and dairy free making it perfect for those who are on a low carb diet. I’m that crazy person that lives in Florida yet makes soup on a weekly basis. Even during the hottest days of summer soup is on my menu. Thankfully, my husband loves soup too and never complains that we are eating soup during the summer months! Most of the time, I make a pot at the beginning of the week and then eat it for lunch. Some weeks my kids choose to enjoy a bowl with me at lunch and other weeks they don’t. My 1 year old loves this soup and surprisingly so does my 4 year old! They have a very sophisticated pallet what can I say. I almost always have dried lentils on hand as well as some sort of canned tomatoes and coconut milk in my pantry. The three staples to this recipe! I use curry powder over paste but honestly either will work! If you have fresh garlic, onion, and ginger on hand you can use them. I’ve made this soup both ways with dried dehydrated versions or with the fresh stuff. I have yet to tell a difference. To me I prefer the dried version because it’s less chopping and prep work for me. The only “fresh” ingredient that I feel is a must for this recipe is fresh cilantro. I LOVE cilantro. Some people hate it–so clearly if cilantro isn’t your thing don’t fret you can leave it out. But I think it is what really elevates this soup to another level. The best part about this soup is you dump just about all the ingredients into the Instant Pot let it cook for 15 minutes (that doesn’t include the time it needs to get up to pressure) and then it’s done! Your lentils will not be firm and crisp they will be more on the mushy side. So adjust your time by a few minutes (2-3 minutes) if you want the lentils more pronounced and not as mushy. I like to save a little bit of coconut milk to drizzle on top and a little extra fresh cilantro to top. I never salt and pepper a soup until it’s done cooking. You can season before serving or serve as is and let your guests season as they go. I like a little cracked black pepper on top, but I leave that out for my kids soup. If you have a n Instant Pot it’s time to dust it off and make this. 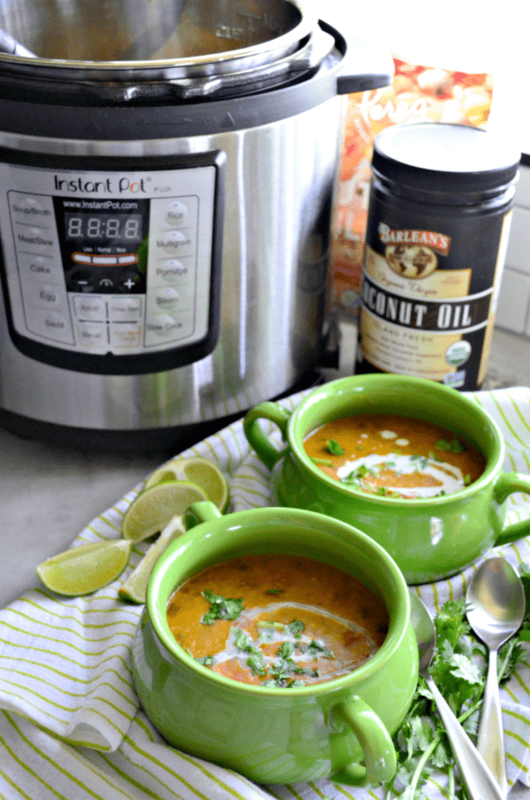 Whether your looking for a bowl full of comfort or maybe a quick dinner tonight I hope you’ll give my Instant Pot Coconut Curry Lentil Tomato Soup a try!